The Navy, Army and Air Force Institutes (NAAFI /ˈnæfiː/) is a company created by the British government on 9 December 1920 to run recreational establishments needed by the British Armed Forces, and to sell goods to servicemen and their families. It runs clubs, bars, shops, supermarkets, launderettes, restaurants, cafés and other facilities on most British military bases and also canteens on board Royal Navy ships. Commissioned officers are not usually supposed to use the NAAFI clubs and bars, since their messes provide these facilities and their entry, except on official business, is considered to be an intrusion into junior ranks' private lives. In 1892, the Hon. Lionel Fortescue, Canteen President of the 17th Lancers, became dissatisfied with the corrupt way in which canteen finances were being handled. He established a system for keeping a locked till in the canteen and put Sergeant John Gardner in charge, an honest and able man who would later look after hundreds and thousands of pounds as one of the staff of the Navy and Army Canteen Board during World War I. The locked till practice was soon adopted by other regiments, until another Canteen Officer, Major Harry Crauford of the Grenadier Guards was also dissatisfied with the food provided for his canteen and approached Lionel Fortescue with the idea of forming a co-operative society and doing their own buying. Together, they managed to raise £400 and founded the Canteen and Mess Co-operative Society. The rule was that interest was not to exceed five percent and all further profits were to be handed to the regimental canteens as a rebate. They hoped that in time the co-operative would become a buying and distributing agency for the whole Army. In August 1914, all arrangements were upset by the outbreak of World War I. The British Expeditionary Force (BEF) - the greater part of Britain's regular Army - was sent to France and hundreds of thousands of young men enlisted to fight for the King and the country. The Government was unprepared for the problem of supplying and feeding the forces on a scale never before experienced, so a large Army entered the field with insufficient official provision. Fortunately the Canteen and Mess Society was still active and was the only contractor which was more concerned with the welfare of the troops than with making money. The Head of the society was summoned to the War Office together with the Managing Director of Richard Dickenson & Co., the soundest and most experienced firm of the canteen contractors. The two organisations were invited to establish a special department and subsequently joined together as the Expeditionary Canteens to serve the nation. Even with the extra money and their combined strength, the service could not be increased fast enough to match the huge expansion of the Armed Forces. In the meantime, many new contractors were finding loopholes for exploiting the situation and it became clear that safeguards were needed to protect the interests of the soldiers and supervise the operations of all these vested interests. In January 1915, a Board of Control was formed and exactly two years later the Army Canteen Committee was registered at the Board of Trade as a company trading not for profit. It absorbed the Canteen and Mess Society, and took over the contracts of Dickenson's and all the other firms supplying the Army in the UK. Within three months it also took over all canteens abroad where British troops were stationed during peace times. The Expeditionary Force Canteens were left in charge in the main theatres of war. In June 1917 the Royal Navy were keen to share in the benefits now being felt by the British soldier and so the Army Canteen Committee assumed the new title of the Navy and Army Canteen Board. When the Royal Air Force (RAF) became a separate arm of the nation's defences in 1918, their canteens were absorbed into the Navy and Army Canteen Board. Lionel Fortescue's vision of a unified canteen system for the Forces was starting to take shape and the nucleus of NAAFI was now in place. In March 1920 Winston Churchill, then Secretary of State for War, set up a committee to advise on the kind of organisation which would be needed for the Armed Forces in the future. The findings were unanimous; there should be one organisation to serve all three Services, it should be permanent and it should be able to rapidly expand or contract at times of war or peace. The Navy, Army, Air Force Institutes was therefore established on 6 December 1920 and started trading as NAAFI in 1921. As a not for profit organisation, with no shareholders to reward, NAAFI was asked to run the catering and recreational establishments needed by the armed forces. It had to make a profit for the good of the NAAFI customers - the men and women of the British Armed Forces- and so in addition it undertook to sell goods to servicemen and their families over and above those that were initially provided by the Royal Army Service Corps (RASC). The servicemen would benefit directly by getting cash rebates and discounts on purchases and indirectly through surpluses given back as a whole from each year's trading. The NAAFI's greatest contribution was during the Second World War. The Chairman & CEO during the war years was Sir Lancelot Royle and by April 1944 the NAAFI ran 7,000 canteens and had 96,000 personnel (expanded from fewer than 600 canteens and 4,000 personnel in 1939). It also controlled ENSA, the forces entertainment organisation. In the 1940 Battle of France alone, the EFI had nearly 3,000 personnel and 230 canteens. Male EFI personnel were members of the Royal Army Service Corps until 1965, then the Royal Army Ordnance Corps. Since 1993 they have been members of the Royal Logistic Corps. Female personnel were members of the Auxiliary Territorial Service until 1949, then the Women's Royal Army Corps until 1992, when they joined the RAOC (and later the RLC). The expression, "You're as dim as a NAAFI candle," (i.e. stupid) is an update of the Great War veteran's slang "dim as a Toc H lamp". The expression to lie "like a cheap NAAFI watch" unfairly relies on the supposed shoddy workmanship of said equipment. In the "Camping In" episode of Are You Being Served?, when Mr Rumbold mentions he was in the Army Catering Corps, Mr Lucas incorrectly assumes that Mr Rumbold actually worked in the NAAFI. He angrily exclaims, 'You were in THE NAAFI??!!' Additionally, in Season 1 Episode 2 of Grace & Favour, Miss Brahms replies to a statement by Captain Peacock by saying "He used to cycle down to the NAAFI to get his five woodbines," after he mentions that when he was in the Army, he "did occasionally climb into the saddle." In Chapter 16 of Lucky Jim, Dixon recalls that Margaret's face reminded him of a man who "had never been seen doing anything except sweeping out the N.A.A.F.I and wiping his nose on his sleeve." In J. Lee Thompson's Ice Cold in Alex, a character questions whether the gin is imported or NAAFI, raising concerns about the spirit's quality. The NAAFI is continuously referenced throughout Spike Milligan's war memoirs. 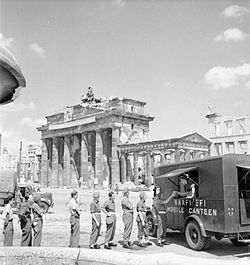 Every week his artillery unit is serviced by the NAAFI, who bring round the NAAFI rations of cigarettes, etc., as well as selling various other sundries such as shoelaces. Even when Milligan leaves the Army, as he is part of an army entertainment troupe, he still gets issued with a NAAFI ration each week. In addition to being the name of the Institute, NAAFI is also used in British service talk as a noun for a type of break, i.e. 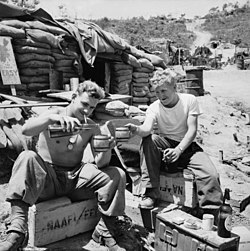 a "NAAFI break", which is a short break or tea break; or an insult to the character of another soldier, e.g. "He's NAAFI!" (No Aim, Ambition and F**k-all Interest). NAAFI has been humorously said to mean "Never 'Ave Any Fags In", referring to frequent shortages of cigarettes. A "NAAFI sandwich" consists of two pieces of bread spread with margarine placed together; that is, it is a "sandwich" with no filling. NAAFI now operates out of bases in British Forces Germany, Brunei, Gibraltar, the South Atlantic Islands, and onboard HM Ships through the Naval Canteen Service (NCS). In Germany it provides the supply of all catering, retail and leisure. This includes running the Officers and NCO's Messes, providing the catering service as well as a number of retail outlets, coffee forums, bars and the sale of tax-free cars. Wikimedia Commons has media related to NAAFI. This page was last edited on 2 April 2019, at 07:56 (UTC).